This app is now based on annual subscription which works out to 57p a week. This is still value for money to ALWAYS have the latest 4 A-Z maps and POI at your fingertips. The Cabbie’s Mate A-Z app is the best map app for taxi drivers, knowledge boys and girls or people who enjoy using the A-Z maps. There is no other map app which provides the comprehensive information and has such ease of use as ours. We now release updated A-Z maps twice a year; in spring and autumn. The A-Z map is now linked to iOS navigation map. You can select a destination on A-Z map, tap on the 'N' navigation button, this will plot your destination on iOS navigation map, calculate your route, ready to navigate. We have two subscription models. A standard Cabbie’s Mate A-Z app which includes the latest 4 A-Z maps and latest POI for £29.99 or a premium subscription for £39.99 which includes the standard app above with 4 quarterly POI updates (POI updates are available in January, April, July and October). This is the only difference between standard and premium. Your annual subscription will give you access to use our Cabbie’s Mate iOS App for one year from the date of your subscription. Subscription automatically renews annually unless auto-renew is turned off at least 24-hours before the end of the current period. Your account will be charged for renewal. Payment will be charged to your iTunes Account at confirmation of purchase. Subscriptions may be managed by the user and auto-renewal may be turned off by going to the user's Account Settings after purchase. Any unused portion of a free trial period, if offered, will be forfeited when the user purchases a subscription for Cabbie’s Mate app. The Cabbie’s Mate app will cease to work if the subscription is not renewed. Download will require 2 GB space and a Wi-Fi connection and will take between 15 - 45 minutes depending on connection speed. Four Geographers’ A-Z maps. These are the Super Scale Central London map, Greater London map (street level Master Atlas), Extended Greater London Main Road map and the Great Britain Road Atlas. 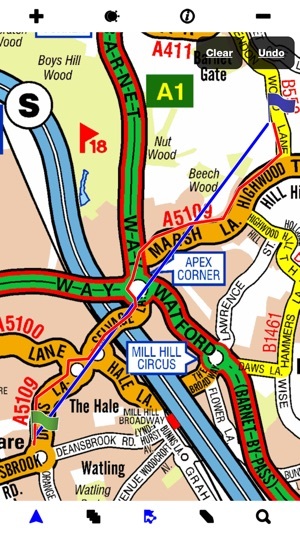 Greater and Central London maps have been customised by Geographers’ A-Z Map Co. Ltd. by colouring more main roads around the City of London to assist route planning; exclusive to our software. Our app contains the latest available maps which are always displayed ‘north up’, your current position is displayed as you move on screen while you drive. Switching between A-Z maps is a one touch operation. Maps can be zoomed in and out – not only by using the ‘pinching’ action but also six levels using the + and - buttons added for even more user friendliness. Our database contains over 39,441 up-to-date specially selected points of interest with full postal address and postcode. Our app will always have our very latest POI file when purchased. 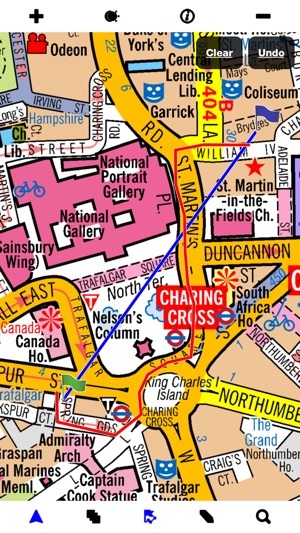 Most major hotels, embassies, theatres, stations and major landmarks are also shown on the Super Scale Central London map. Searching couldn’t be easier, it is the fastest of any mapping application. Our customised predictive keyboard and alphabetical search system finds and displays a street, postcode or point of interest within ten seconds. When connected to GPS, your current position is clearly displayed on the map. 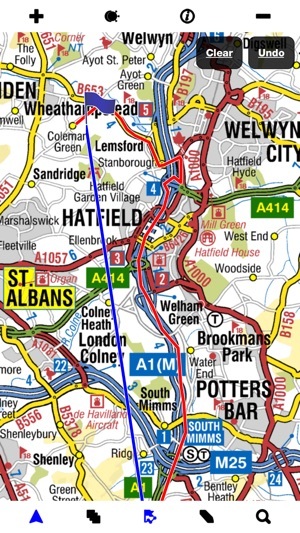 Having selected a destination, our A-Z app automatically draws a straight, as the crow flies, blue ‘cotton line’ from your position to the chosen destination to facilitate route planning. Additionally, you can select an alternative start point on the map by pressing down on the map; the app will draw the ‘cotton line’ from there to your chosen destination. The app includes centre GPS, zoom in/out, map switch, day/night mode, route plotting, eraser, info, navigation (N), trace and search buttons on the tool bar. Simple user manual is located under ‘i’ button. By far the best London map in circulation. However £40 a year to access it is not reasonable. There is no gps function or traffic update that they are charging a hefty subscription amount. But slight less quality google maps doesn’t exactly the same with a traffic management tool & gps function. You can charge a nominal fee, but £40 is poor, very poor. 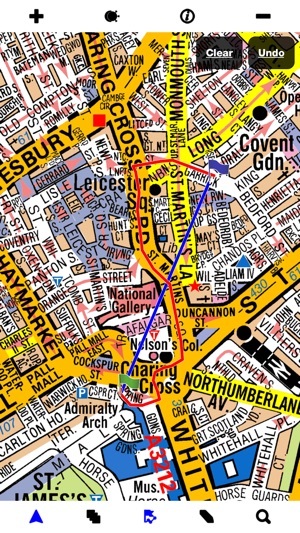 What a terrific app for anybody who needs to navigate London and not just for cab drivers. This is a gift for delivery drivers and even emergency vehicle crews. Worth every penny.